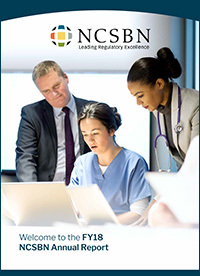 This annual report functions as a formal summary of NCSBN’s performance and activities during fiscal year 2018. NCSBN divides its Annual Report into two parts. The first part includes financial and business information including operating statements and listings of the Board of Directors, committees and staff that follows NCSBN’s fiscal year spanning Oct. 1, 2017 to Sept. 30, 2018. This document is posted here. 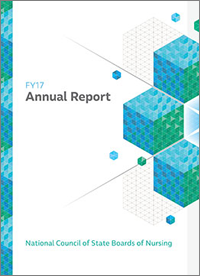 This annual report functions as a formal summary of NCSBN’s performance and activities during fiscal year 2017. NCSBN divides its Annual Report into two parts. The first part includes financial and business information including operating statements and listings of the Board of Directors, committees and staff that follows NCSBN’s fiscal year spanning Oct. 1, 2016 to Sept. 30, 2017. This document is posted here. 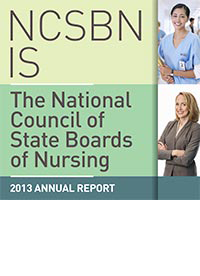 NCSBN’s annual Year In Review is an interactive companion to NCSBN's 2016 Annual Report, featuring events, activities and NCLEX Examination statistics for the entire calendar year 2016. 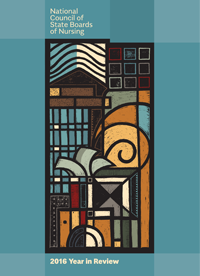 Inside this yearbook are easily accessible links to videos, slideshows and other online resource documents as well as additional information about the subjects covered in the publication. This annual report functions as a formal summary of NCSBN’s performance and activities during fiscal year 2016. 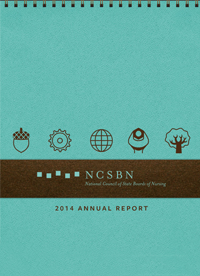 This year NCSBN has divided its Annual Report into two parts. The first part includes financial and business information including operating statements and listings of the Board of Directors, committees and staff that follows NCSBN’s fiscal year spanning Oct. 1, 2015 to Sept. 30, 2016. This document is posted here. 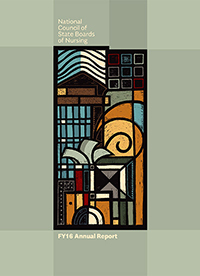 This annual report functions as a formal summary of NCSBN’s performance and activities during fiscal year 2015. It also provides financial information, NCLEX pass rates, member achievements, a timeline of NCSBN activities and NCSBN facts. 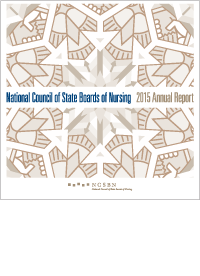 This annual report functions as a formal summary of NCSBN’s performance and activities during fiscal year 2014. It also provides financial information, NCLEX pass rates, member achievements, a timeline of NCSBN activities and NCSBN facts. This annual report functions as a formal summary of NCSBN’s performance and activities during fiscal year 2013. It also provides financial information, NCLEX pass rates, member achievements, a timeline of NCSBN activities and NCSBN facts. This annual report functions as a formal summary of NCSBN’s performance and activities during fiscal year 2012. It also provides financial information, NCLEX pass rates, member achievements, a timeline of NCSBN activities and NCSBN facts. 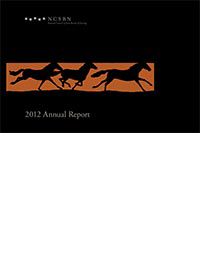 This annual report functions as a formal summary of NCSBN’s performance and activities during fiscal year 2011. It also provides financial information, NCLEX pass rates, member achievements, a timeline of NCSBN activities and NCSBN facts. 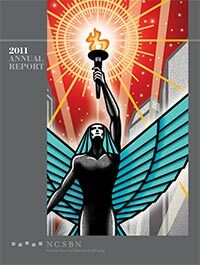 This annual report functions as a formal summary of NCSBN’s performance and activities during fiscal year 2010. It also provides financial information, NCLEX pass rates, member achievements and NCSBN facts. This annual report functions as a formal summary of NCSBN’s performance and activities during fiscal year 2009. It also provides financial information, NCLEX pass rates, member achievements and NCSBN facts. 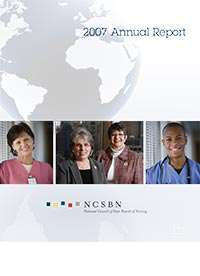 This annual report functions as a formal summary of NCSBN’s performance and activities during fiscal year 2008. It also provides financial information, NCLEX pass rates, member achievements and NCSBN facts. This annual report functions as a formal summary of NCSBN’s performance and activities during fiscal year 2007. It also provides financial information, NCLEX pass rates, member achievements, a timeline of NCSBN activities and NCSBN facts. 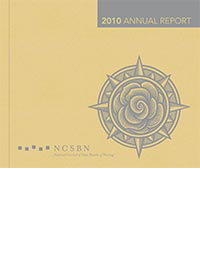 This annual report functions as a formal summary of NCSBN’s performance and activities during fiscal year 2006. It also provides financial information, NCLEX pass rates, member achievements, a timeline of NCSBN activities and NCSBN facts. This annual report functions as a formal summary of NCSBN’s performance and activities during fiscal year 2005. It also provides financial information, NCLEX pass rates, member achievements, a timeline of NCSBN activities and NCSBN facts.